I was wondering how the use of various company names worked, so this interview had some nice details. Plus info on using the Disney Princesses and the Gord character. Did you have to get permission to use the logos, or talk to the companies about how you were portraying them? RM: Actually? No. It’s kind of the equivalent of a live-action movie. Say they’re shooting a movie in Chicago, and a car is driving around, and we’re seeing in the background things we know, like Starbucks or McDonald’s. You don’t have to go through and paint that stuff out, because it’s just part of the tapestry of the environment. Now, if we were making comments about those companies, or using their mascots, then you get into legal ramifications. But if it’s just the signage in the background, then that’s fine. Speaking of working with companies about portrayals, what was the conversation like with Disney about how you could use the princesses, about how far you could go with the humor? RM: Well, when we first imagined that scene, we made a very rough version of it, just to be able to show people, “This is what we’re thinking, how we would like to use some of our character in a way that’s kind of satirical. We’re taking a little air out of ourselves.” We wrote the scene and built a very crude version of it using storyboards, just black-and-white drawings, a scratch soundtrack. It was none of the actresses who did the parts originally. And we made that so we could show it to our colleagues at our studio, and say, “What do you think?” And it got a great reaction. I realize I am late to the party (family stuff), but a few words about “Ralph Breaks The Internet” (PG). Basically, Ralph and Vanellope travel to the Internet to bid on a new steering wheel for Sugar Rush after Ralph accidentally causes the old one to get broken. Vanellope becomes enamored with an online multi-player game called “Slaughter Race”, and Ralph becomes an viral video sensation to earn money to pay for the replacement steering wheel. In the meantime, ALL of the Disney princesses get to act in ways that will have you cheering. I really don't want to reveal more as this movie perfectly nails the insanity of the World Wide Web, and you just need to see it for yourself. I give a standing ovation to this brilliant, funny, inventive follow up to “Wreck-It Ralph”, a perpetual favorite in the Orbi-Wan household. That equates to at least 4.5 out of 5 lightsabers. SPOILERS: To parents, be aware there are some things of concern for the youngest viewers. “Ralph Wrecks The Internet” is related PG for some slightly scary images, slightly mature themes, and mild language. A virus briefly invades Slaughter Race, then the Internet itself, and the personification of the virus in its various forms is a little weird-looking. A pop-up ad briefly mentions something about meeting housewives online. Slaughter Race has a very “Grand Theft Auto” feel about it, and the tape outlines of two losing players are briefly shown. Words include “gol-durned”, “fart”, and some G-rated variations of naughtier words. A mid-credit scene jokes about the trailer showing things that don't end up in the movie. An after-credit scene promises a preview of another Disney sequel, then, well, just don't leave the theater. Trust me. LIKE and SHARE the page ORBI-WAN GOES TO THE MOVIES with family and friends! ORBI-WAN GOES TO THE MOVIES is protected under Creative Commons. Can’t wait to see this on home release. Just saw first again in 3D and it was just marvelous. Saw this with the kiddos yesterday. Loved the original and loved this one...for the most part. I was skeptical about the movie & characters leaving their video game roots but despite the movie taking place on the net, the overarching plot still revolved around games and Ralph and V in Slaughterhouse Race game was fantastic. Gal Gadot was great as Shank. Sarah Silverman was amazing in this one. V was less annoying and more adorable than anything. The whole Disney princess sequence was worth the price of admission alone. I would watch a whole movie with these 14 gals. And to get ALL the voices back for all the modern princesses (dating back to Ariel) was damn impressive and very cool. Referencing the studios with Merida was great. The ending was emotional and felt earned given how well V's and Ralph's relationship has developed over the course of two films. Where it seems they dropped the ball for me was in the video game hub at the beginning and end and just video games at all. In the first movie the hub was a bustling center of cameos left and right. In WIR2 the hub is a ghost town. They gave us Sonic, Pac-Man, Street Fighter characters and Tapper. It was almost sad in its vacantness. I wasn't a fan of the dark web and virus stuff. The giant Ralph avatar and King Kong homage didn't work for me. I don't want to say it detracted from the movie, but it was definitely the weakest part of the film. Also they missed a great opportunity at a V & Ralph reunion. Ralph could have worked more on the internet to buy a Slaughterhouse Race arcade machine for the arcade owner. Or if Slaughterhouse Race was never an arcade game in the movie world, have the arcade owner convert a room for modern online e-gaming. Then, boom, V and Ralph reunion at the arcade. I guess that could be addressed in a part 3. Lastly, there is a mid-credits scene and another one at the very end. Parents will love the one at the end, little ones won't get the joke. The mid-credits one was great as it kinda broke the fourth wall referring to the original teaser/trailer. Saw this yesterday and loved it. I have the same issues Corvin mentioned above regarding the spoilery stuff, but overall, it was delightful and engaging. I saw the mid-credits scene but didn't even think to stick around for the post-credits scene. I was worried that the movie would lean too hard into YouTuber culture (I was expecting a bunch of YouTuber cameos for some reason) but luckily they didn't go that route at all, and I actually like the way it was portrayed for the most part. Also, since we watched the first flick on Saturday, it was a nice touch that V being a princess was established in that film, and not retrofitted into this one out of nowhere. Dumb question: Is Merida the only Pixar princess? Yeah, I had to think about it when I heard that "other studio" line, but yes, she is indeed the only one. I recognized Kelly MacDonald's name in the credits, but I didn't realize that they got every Princess voice actor right back to Ariel, that's really cool. I agree about the spoiler stuff above too, it was the only part of the film that felt a bit weak to me. Looked kind of cool and creepy but didn't really work with the rest of the story IMO. Peggy Orenstein wrote an article for the New York Times a decade or so ago (also collected in her book "Cinderella Ate My Daughter" which is a great read if you have daughters) about the exec who started the Disney Princess line. They were so protective of their "individual mythologies" that they never allowed the princesses to even look at each other in group shots. That alone makes what happened in this movie amazing. Let alone the fact that Moana, Elsa, and Anna aren't officially part of the "Princess" line, being their own brands (for now). And the announcement when they got all the living voice actors. Only one I'd really like to have seen is Giselle from Enchanted. Gisele crossed my mind but I couldn't recall if Enchanted was a Disney flick. The only other one they could have done something with would be Leia, but with Fisher's death, it was probably best to leave Leia out of this one. Shoot, they got Wonder Woman, how many more crossovers could they have? The princess scene was awesome. I recognized a lot of the original names in the credits but for some like Pocahontas, I'm more familiar with the singing voice than the speaking one. I also was wondering about the use of company logos, so fu's article was interesting. I still wonder about product placement. Some like YouTube and Amazon you kind of have to use to represent the internet, but it seems like there were some others that were a little more random. Thanks! 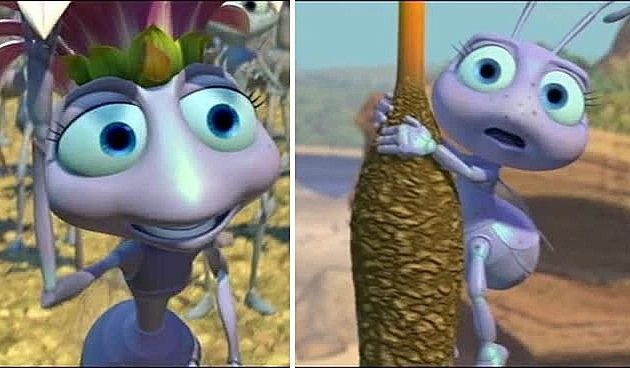 I wasn't sure if Pixar had any other ones that just weren't in this movie. Didn't think of that. Guess it counts, but officially I think you have to be human to be part of the Disney princess line. I love this series and he did one on RBtI so here you go. No Nala in a frilly dress singing a song? There's a lot of other (non Pixar) princesses that aren't included: Megara (from Hercules), Esmerelda (from Hunchback, originally part of the Princess line but removed), the princess from Atlantis, etc., but it's mainly about marketing anyway. I mean there's no way Mulan is a "princess." Saw it with my 3-yr old last weekend. I agree that the Disney Princesses scenes were worth the price of admission. Especially the ending where they all work together and even the music themes for each princess were in sync with which one the action was focused on. So good. We went and saw it today and loved it even more than the first one. We didn't stay for the credits, so would someone post what when on during and after the credits? Thank you if you can. First scene was from one of the trailers with Ralph and Vaneloppe feeding the virtual rabbit non stop until it exploded. Traumatizes little girl. Second was a special sneak preview of Frozen 2.